This past Saturday boxing superstar Manny Pacquiao returned to the squared circle for the first time in over a year. His opponent was Lucas Matthysse, who held the minor version of the WBA title. Not only was this the 39 year old Pacquiao’s first contest after a long stretch of inactivity, but it was also his first bout since he parted with long time trainer Freddie Roach. Pacquiao and Roach had worked together as a team the previous 17 years. Pacquiao dominated Matthysse without much trouble, and he dropped him three times in total before finally scoring the knockout in round 7 of the scheduled 12 rounder. The first knockdown was achieved with a sneaky left uppercut in round 3. The next knockdown came towards the end of round 5, where Lucas really just took a knee after getting hit with a series of rights punctuated by a hook. And the third and final knockdown came in round 7, this one also scored by a left uppercut. So Manny Pacquiao proved he is still fast, he proved he still has some power, and he proved that he can still excel against a shopworn fighter who does not utilize much of a defensive strategy. Pacquiao looked sensational however, all things considered and surely he earned himself another big fight under a bigger spotlight than Matthysse was able to provide him. Right now there are currently three undefeated welterweight champions, all of whom might be considered as a future foe for Pacquiao. The WBC title is vacant at the moment, the WBA title belongs to Keith Thurman, the IBF belongs to Errol Spence Jr, and the WBO belongs to Terence Crawford. This new generation of title holders might be a tall order for the 39 year old who might be better off steering clear of those fights. 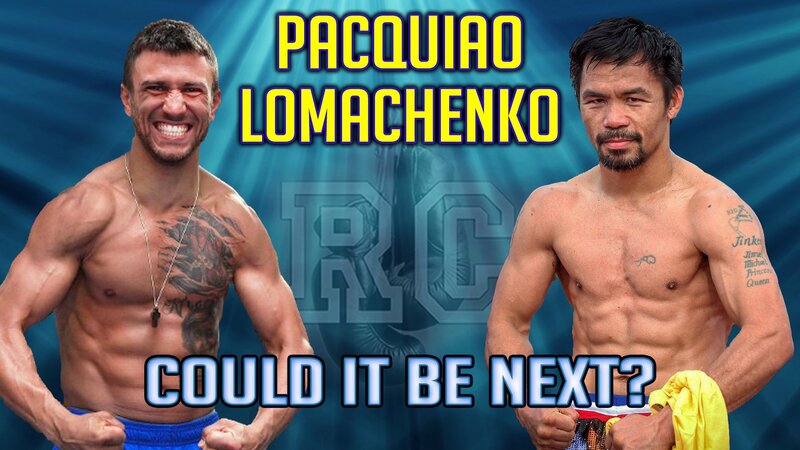 But there are still a number of interesting options available for Pacquiao – Vasyl Lomachenko chief among them. This edition of Rummy’s Corner provides a brief recap of Pacquiao’s recent knockout victory against Matthysse, while also exploring possibilities of who might be next in line to face the iconic Manny Pacquiao. Please watch and enjoy the video! Previous boxing news: Left-Hook Lounge Mailbag: Pacquiao Victory, Pacquiao Better Without Roach?, Pacquiao v Lomachenko? You are here: Home / Boxing News / VIDEO: Vasyl Lomachenko vs Manny Pacquiao?